" May Your name be adored and loved by all. May Your love reign in all hearts "
The Redemptorists the world over know that they have someone quite special as their Father Founder. Alphonsus Liguori is not just a Saint,but a Doctor of the Church. The Church has only ever conferred this title on 36 of her Sons and Daughters. St. Alphonsus Maria de Liguori is a Doctor of Prayer.
" If you pray you are sure of saving your soul. If you do not pray you are just as sure to lose your soul." You are fire; enkindle in me your love. You are light; enlighten my mind with the knowledge of eternal things. You are the Dove; give me innocence of life. You are the gentle Breeze; disperse the storms of my passions. You are the Tongue; teach me how to bless you always. You are the Cloud; shelter me under the shadow of your protection. O Giver of all supernatural gifts, who filled the soul of the Blessed Virgin Mary, Mother of God, with such immense favours, I beg You to visit me with Your grace and Your love and to grant me the gift of holy fear, so that it may act on me as a check to prevent me from falling back into my past sins, for which I beg pardon. Grant me the gift of piety, so that I may serve You for the future with increased fervour, follow with more promptness Your holy inspirations, and observe your divine precepts with greater fidelity. 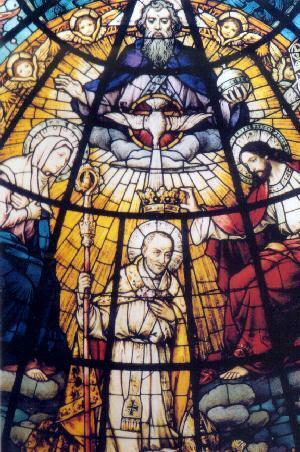 In this picture we see St Alphonsus lovingly adore Jesus in the Blessed Sacrament. O my dear Jesus, what can you do to make me love You? in order to unite Yourself to poor sinners! that you have not refused to give Yourself again and again entirely to me in Holy Communion. And yet I have had the courage to drive You away from my soul on so many occasions! You do not despise a humble and contrite heart. You became human for my sake. You even went so far as to become my food. What more can there remain for You to do in order to gain my love? Oh, that I could die with grief every time that I remember that I have despised Your grace. I repent, O my love, with my whole heart for having offended you. I love You, O infinite goodness! I love You, O infinite love! I desire nothing but to love You, and I fear nothing but to live without your love. My beloved Jesus, do not refuse to come to me. Come, because I would rather die a thousand times than drive You away again. I will do all that I can to please You. Come and inflame my whole soul with Your love. my sovereign and my only good. In a word, the Three Persons of the Most Holy Trinity have endeavoured to show the love which God has borne us, that we may love him through gratitude. It is, then, but just that we love that God who has been the first to love us, and to put us under so many obligations by so many proofs of tender love. Oh! what a treasure is charity! it is an infinite treasure, because it makes us partakers of the friendship of God. But, to acquire this treasure, it is necessary to detach the heart from earthly things. “Detach the heart from creatures," says St. Teresa, "and you shall find God." In a heart filled with earthly affections, there is no room for divine love. Let us therefore continually implore the Lord in our prayers, communions, and visits to the blessed sacrament, to give us his holy love; for this love will expel from our souls all affections for the things of this earth. ”When," says St. Francis de Sales, ”a house is on fire, all that is within is thrown out through the windows." ”What, O my Lord, but thee alone, do I desire ?" You made Mary full of grace and inflamed the hearts of the apostles with a holy zeal. O Holy Spirit, melt the frozen, warm the chilled, and enkindle in us an earnest desire to please you. The Novena for Christmas is given in full below. To quickly get to the current Day click on the Meditation number/ Date. Meditation 1 - December 16th The love that God has shown to us in becoming human. Meditation 2 - December 17th The love of God in being born as an infant. Meditation 3 - December 18th The life of poverty which Jesus lived, even from his birth. Meditation 4 - December 19th The life of humility which Jesus lived, even from his infancy. Meditation 5 - December 20th The life of sorrow which Jesus lived, even from his birth. Meditation 6 - December 21st The mercy of God in coming from heaven to save us by his death. Meditation 7 - December 22nd The journey of the Infant Jesus to Egypt. Meditation 8 - December 23rd The sojourn of the Infant Jesus in Egypt and Nazareth. The love that God has shown to us in becoming human. Think about the great love God has shown us by becoming human in order to obtain eternal life for us. Our first parents, Adam and Eve, rebelled against God and were driven out of paradise. As a result, they and all of us, their descendants, were condemned to everlasting death. But the Son of God, grieving because humanity was lost, took upon himself our human ﬂesh. Then, in order to save us from death, he died on a cross, condemned as a criminal. How would we react if a millionaire took compassion on a dead worm and chose to become a worm himself, offering his own blood as a transfusion, and died in order to restore life to the other worm? Yet the eternal Word has done even more than that for us. God, the Creator, has become like us, one of his own creatures, to share in our human life, so that we can share once again in his divine life. When God realized that all the natural gifts he had bestowed on us could not win our love for him, he became one of us and gave himself entirely to us. “The Word became ﬂesh, and lived among us”(John 1:14a). Through sin, humanity separated itself from God. But God, because of his great love for us, came from heaven to seek us. Why? In order that we might realize how much God loves us, and in gratitude love God in return. Any time a cat or a dog comes to us from across the room, we can’t help but respond by petting it and speaking to it. So why do we ignore God, who comes to us all the way from heaven? Son of God, you became human in order to make yourself lovable to us. But where is the love that we should have for you in return? After all, you have given your life to save us. Yet, why are we so indifferent to your presence? I admit that I myself have not always paid attention to you, your love, or your gifts. But your birth, your death and Resurrection, the gift of Eucharist, provide me with hope. Forgive the times that I have failed to acknowledge your inﬂuence in my life. I love you, O Incarnate Word. I love you, O my God. I love you, O Inﬁnite Goodness. And I ask forgiveness for all the sins that I have committed, large and small, public or private. I wish that I could die for you. Dear Jesus, give me the gift of love for you. Let me never again feel complacent over the trials you endured for me. I want to love you always. Give me perseverance in loving you. O Mary, Mother of God and my mother too, obtain for me from your son the grace to love him always, even unto death. The love of God in being born as an infant. The Son of God, in becoming human for our sake, might have appeared in the world at the age of a grown man, the way Adam appeared when he was created. But since children usually attract greater love to themselves from those who take care of them, Jesus chose to appear on earth as an infant; and as the poorest and most miserable infant ever born. Saint Peter Chrysologous wrote: “Our God chose to be born this way because he wanted to be loved.” The prophet Isaiah had already predicted that the Son of God was to be born an infant and give himself entirely to us through the love he bore for us: A child is born to us, a son is given to us (Isaiah 9:6a). O my Jesus, almighty and true God, what else could possibly have attracted you to come from heaven and be born in a cave, if not your love for us? What convinced you to leave the lap of your Father and lay yourself down in a manger? What drew you down from your throne above the stars to stretch yourself out on a little pile of straw? What, from the midst of the nine choirs of angels, has placed you between these sheep and oxen? You inﬂame the seraphim with holy ﬁre, yet look, you tremble from the cold in this stable! You give the sun, the stars, and the planets their paths of movement, yet now you cannot move at all without being carried in someone’s arms! You provide food for all creatures, and yet now you depend on a little milk to sustain your life. You are the delight of heaven, and yet how is it that I now hear you whimper and cry? Tell me, who has reduced you to such lowliness? “Who has done this? Love has done it,” says Saint Bernard. Yes, the love that you have for us has done it. O dearest Infant, tell me what you came on earth to do. Tell me whom you are seeking. Ah, yes, I now understand…you have come to die for me, a lost sheep, in order that I may no more hide from you, but love you. O Jesus, my treasure, my life, my love, my all, if I do not love you, then whom shall I love? Where can I ﬁnd a mother or father, a friend, or a spouse more loving than you? And who has ever loved me more than you have? I am sorry that I have lived so many years in this world and yet still love you so little, even having offended you and sometimes forgotten you. Forgive me, O my beloved Redeemer, for I regret that I have ever treated you so badly. I am sorry with all my heart. Forgive me, and give me your grace so that I may never again separate myself from you, and so that I may love you constantly for the rest of my life. O my love, I give myself to you entirely. Accept me, Lord, and do not reject me, even though I might deserve it. O Mary, you are my advocate. You always obtain whatever you ask from your son. Beg him to forgive me, and to help me persevere until death. The life of poverty which Jesus lived, even from his birth. God planned that when his Son was to be born on earth an edict would be promulgated by the emperor, obliging the head of every household to go to the place of his birth and register. And so, Joseph had to go with his wife to Bethlehem, to enrol according to the decree of Caesar. While there, Mary’s time of delivery arrived. Because she had been driven from all the other houses and even from the common shelter for poor people, she ended up spending the night in a cave, and there gave birth to the King of Heaven. It is true that Jesus would have been just as poor if he had been born in Nazareth. But at least there he would have had a dry room, a little ﬁre, warm clothes, and a comfortable cradle. But no, he chose to be born in a cold cavern without a ﬁre to warm him. He chose to have the livestock’s manger for his cradle, and a little prickly straw for his bedding, in order that he might experience what poor people have to experience. Let us enter that cave in Bethlehem, but let us enter with faith. If we go without faith we will see nothing but a poor infant, who moves us to compassion by seeing him so beautiful, but shivering with cold and crying from the itchiness of the straw on which he lies. But if we enter with faith, we will believe that this child is the Son of God, who loved us so much that he came down to earth and endured so much to pay for our sins. How could we not thank him and love him? O sweet infant, how can I be so ungrateful to you and offend you so often, knowing how much you have done for me? But the tears you cried, and the poverty you chose to endure out of love for me, give me hope in the forgiveness of all the sins that I have committed. I regret, my Jesus, that I have turned my back on you and on my sisters and brothers so often. I love you above all other things. You are my God and my all! From this day forward, you will be my only treasure and my only good. With Saint Ignatius of Loyola, I will say, “Give me your love, give me your grace, and I will be rich.” I wish for and I desire nothing else. You alone are sufﬁcient for me, my Jesus, my life, my love. O Mary, so close to Jesus, help me to be grateful for the gift of faith in your son. The life of humility which Jesus lived, even from his infancy. All the clues that the angels gave the shepherds to help them ﬁnd the Saviour, who had just been born, were marks of humility:This will be a sign for you: you will ﬁnd a child wrapped in bands of cloth and lying in a manger (Luke 2:12).This is how you will ﬁnd the newborn Messiah, the angel said. You will ﬁnd him as an infant, wrapped in poor ragged clothes, in a stable, lying on straw in a manger for animals. That is how the King of Heaven, the Son of God, was born, because he came to destroy the pride that had been the cause of humanity’s spiritual ruin. The prophets foretold that our Redeemer would be treated as the most wretched person on earth, and that he would be overwhelmed with insults. How much ridicule Jesus had to tolerate because of us! He was treated as a drunkard, as a magician, as a blasphemer, and a heretic. Think of how many insults he had to endure during his passion. He was abandoned by his own disciples. One of them even sold him for thirty pieces of silver, and another denied having ever known him. He was led through the streets bound like a criminal, scourged like a slave, treated like a madman, and mocked as a bogus king. He was struck, spit upon in the face, and ﬁnally he was put to death on a cross, suspended between two thieves. One would think that he had been the greatest lawbreaker the world had ever seen. Saint Bernard commented that the noblest of all men, Jesus Christ, was treated like the most depraved person of all. “But, my Jesus,” he adds, “the more degraded you are, the more dear you are to me.” The more humbled and despised he appears, the more esteemed and worthy of our love he becomes. O sweet Saviour, you have embraced so much disgrace for love of me, and yet I cannot bear a word of insult without immediately thinking of revenge—I, who often deserve to be trampled underfoot by all those whom I have harmed. I am ashamed of appearing before you, such an arrogant sinner that I am. O Lord, do not drive me from your presence, as I deserve. You have promised that you cannot condemn a heart that repents and humbles itself. I regret all the offences I have ever committed against you or against my neighbour. Forgive me, Jesus, for I will not offend you or anyone else ever again. You have put up with so many wounds for my sake. For your sake, I will bear all the difﬁculties that may come my way. I love you, my Jesus; you who endured such evil for my sake. I love you, my Good, above every other good. Give me your help, that I may always love you and that I may endure every trial for love of you. O Mary, recommend me to your son. Pray to Jesus for me. The life of sorrow which Jesus lived, even from his birth. Jesus could have saved us without suffering and without dying. But he willingly chose a life full of tribulations to show how much he loved us. The prophet Isaiah called him the man of sorrows (Isaiah 53:3) because the life of Christ was to be full of woe. His passion did not begin at the time of his death, but from the beginning of his life. Imagine Jesus, as soon as he was born, lying in a stable, where everything caused distress for him. His sight was troubled because he could see nothing in that cave but dark, rough walls. His sense of smell was haunted by the stench of dung from the animals lying nearby. His skin was irritated by the itchy straw that served as his bed. Soon after birth, he was forced to ﬂee to Egypt, where he lived several years of his childhood, poor, and despised as a foreigner. The life he led afterward in Nazareth was not much better. Then consider how his life ended in Jerusalem, dying in anguish on a cross. O my sweet Love, did my sins keep you in a state of agony during all of your earthly life? Then, tell me what I can do so that you will forgive me, for I will leave nothing undone. I regret all the offenses I have ever committed against you, O my greatest Good. I repent, and I love you more than I love myself. I feel a great desire to love you. You have given me this desire, so now give me the strength to love you even more intensely. It is only just that I, who have offended you so much, should also love you so much. Remind me constantly of the love you have for me, so that my soul may always burn with love for you, and so that I may think of you alone, desire you alone, and strive to please you alone. O God of Love, I was once a slave to this world. But now I give myself entirely to you. Accept me in your mercy, and from this day forward bind me with your love, O Jesus. I will love you while I live, and in loving you, I will die. O Mary, my mother and my hope, help me to love Jesus. This alone is the favour I desire and ask from you. The mercy of God in coming from heaven to save us by his death. Saint Paul says the goodness and loving kindness of God our Saviour appeared (Titus 3:4). It was then, when the Son of God made man appeared on earth, that we saw how great the goodness of God is toward us. Saint Bernard wrote that the power of God ﬁrst appeared through the creation of the world, and sustaining the world has shown God’s wisdom. But God’s mercy appeared to an even greater degree when God took human ﬂesh to save lost humanity by his sufferings and death. And what greater mercy could the Son of God have shown us than to take upon himself the pains we have deserved? Imagine him as a newborn infant, wrapped in swaddling clothes in a manger, unable to move or feed himself. Just to survive, he relied on Mary to feed him with a little milk. Imagine him many years later, in the judgment hall before Pilate, bound to a column by ropes from which he could not loosen himself, and scourged from head to foot. Imagine him on the journey to Calvary, falling down as he went along the road, from weakness, and from the weight of the cross that he carried. Finally, imagine him nailed to that infamous tree upon which he ﬁnished his life, in agony and suffering. Jesus Christ wished to gain all the endearments of our hearts by his love for us, and therefore he would not send an angel to redeem us, but came himself, to save us by his passion and Resurrection. If an angel had been our redeemer we would have a divided heart—loving God as our creator and the angel as our redeemer. But because God, who is our Creator, wants our whole heart, he chose to also be our Redeemer. O my Redeemer, where would I now be if you had not shown me so much patience, but instead had condemned me to death while I was still in sin? Since you have waited for me, O Jesus, forgive me now and quickly, before death surprises me while I am still guilty of so many offenses against you. I regret, O my greatest Good, having ignored your Word and your commands. I feel like I could die of shame over my sins. But I also know that you cannot ever forsake anyone who seeks you. If I have failed you in any serious way in my life, I resolve from now on to seek only you, and to love only you. Yes, dear God, I love you above all things. I love you more than I love myself. Help me, Lord, to love you always for the rest of my entire life. I ask for nothing more, and I trust that you will grant it. Mary, my hope, please pray for me; for if you do, I am certain to receive God’s grace. The journey of the Infant Jesus to Egypt. That very night, still crying, she took the baby Jesus, and she and Joseph set off on their journey. Think about how much these lonely pilgrims must have suffered while making such a long journey, deprived of every comfort. The infant was not yet able to walk, so Mary and Joseph had to take turns carrying him in their arms. During the journey through the desert of Egypt, their only bed at night was the bare earth in the open air. The Infant wept in the cold, and Joseph and Mary also wept out of compassion for him. Who would not weep, after all, seeing the Son of God, poor and persecuted, wandering about on the earth so that he would not be killed by his enemies? O dearest infant Jesus, I hear you cry. And you ought to cry, being neglected by your very own creatures whom you love so much! O my God, I have also neglected you and sinned against you. But now I resolve to love you even more than I love myself. And there can be no sorrow greater than that which I suffer, recalling how I have ignored you, my greatest Good. Please forgive me, my Jesus, and allow me to carry you in my heart during the rest of my life’s journey, so that I may enter eternity with you as an essential part of my life. I have so often turned away from you through sin. From now on I will love you above all other things. I repent of all the ways I have ever ignored or offended you by hurting someone else. My beloved Lord, I will never ignore you again. Give me strength to resist temptations. Do not allow me to turn from you. I would rather die than do something that offends you or my neighbour. O Mary, my hope, help me to live always in response to God’s love. The sojourn of the Infant Jesus in Egypt and Nazareth. Our blessed Redeemer spent his infancy in Egypt, living there for seven years in poverty and contempt. Joseph and Mary were unknown there, with neither relatives nor friends. And they could scarcely earn enough to get by through the labour of their hands. Their cottage was poor, their bed was poor, and their food was poor. In this humble hut, Mary weaned Jesus. At ﬁrst she fed him from her breast. Later on, she took a little bread soaked in water and placed it in his mouth. It was in that cottage that she made his ﬁrst little garment, taking off his swaddling clothes and dressing him in regular ones. In that cottage, the child Jesus took his ﬁrst steps, although he kept faltering and toppling many times, just as other children do. There, also, he uttered his ﬁrst words, but with hesitation. Imagine what God has reduced himself to for love of us! God, stumbling and falling as he walked! God, stammering while he spoke! The life Jesus led at the house in Nazareth after his return from Egypt was much the same: poor and humiliating. Until age thirty, he was a simple shop boy, obeying Joseph and Mary. And he was obedient to them (Luke 2:51).Jesus went to fetch water; Jesus opened and closed the shop; Jesus swept the house; he gathered wood for the ﬁre, and worked all day helping Joseph. Imagine God living as a boy! God sweeping the ﬂoor! God sweating as he planed a piece of wood! And who was he? The all-powerful God, who with a simple nod created the whole universe, and who could destroy it just as easily if he wished! Should not the mere thought of this move our hearts to love him? How inspiring it must have been to watch the devotion with which Jesus said his prayers, the patience with which he laboured, the haste in which he obeyed, the moderation he used in eating, and the kindness and charity with which he spoke and interacted with others! Every word, every action of Jesus was so virtuous that it ﬁlled everyone around him with love for God—but especially Mary and Joseph, who were constantly with him! O Jesus, my Saviour! I realize that you, who are my God, lived for many years unknown and looked down upon in poverty because of your love for me. How, then, can I desire the pleasures, honours, and riches of the world? Although they are not bad things, I renounce them all, and I want to be your companion here on earth—poor like you, humble like you, and despised like you. Then I hope to one day enjoy your company in heaven. After all, what can the kingdoms or the treasures of earth amount to? My Jesus, you will be my only treasure, my only Good. I greatly regret the many times in the past that I have disregarded your friendship while satisfying my own desires. Now I repent with all my heart. From now on, I would be willing to die a thousand times over rather than destroy my relationship with you. My God, I want to offend you no more. I want to love you always. Help me be faithful to you for the rest of my life. Sweet Mary! You are the refuge of sinners. You are my hope. The birth of the Infant Jesus in the cave of Bethlehem. Since the Roman emperor’s edict said that everyone was to enrol in his own country, Joseph and his wife, Mary, departed for Bethlehem. The trip took four days, traveling over mountainous roads in the cold of winter wind and rain. Think of how much the Blessed Virgin must have suffered on that journey. And since the time for the birth had arrived, the Holy Virgin was in prayer. Suddenly the cave became brilliantly lit, as if by the sun or a star, and the Son of God came forth into the world as a tender infant, crying and trembling with cold. The ﬁrst thing Mary did was to adore him as her God. Then she held him to her bosom, and wrapped him in swaddling clothes that she had brought along. Finally, she laid him on a little straw in the manger. That is how the Son of the eternal God chose to be born for love of us. A saint once said that those who love Jesus Christ most ought to kneel at the feet of the Holy Child and, in spirit, perform for him the same service as the beasts in the stable at Bethlehem who warmed him with their breath. We should warm him with our sighs of love. O tiny Infant! I would not be so bold as to lie at your feet, except that you yourself have invited me to come near. My sins have caused you to cry so many tears while in your stable at Bethlehem. But since you have come to earth to forgive repentant sinners, please forgive me, also. I regret with all my heart having ignored you so often. You give so many great graces to everyone on this holy night. Bring peace to my soul and to the world. The one gift I ask this Christmas is the grace to love you forever with my whole heart. Inﬂame me, Lord, with your love! I do love you, O God, who has become a mere child for me. Never let me stop loving you. Mary, my mother, God will do all things you ask in prayer. Pray to Jesus for me. O Holy Patriarch, I rejoice with you at the exalted dignity by which you were deemed worthy to act as father to Jesus, to give Him orders and to be obeyed by Him whom Heaven and earth obey. I choose you, after Mary, to be my chief advocate and protector. I promise to honour you every day by some special act of devotion and by placing myself under thy daily protection. By that sweet company which Jesus and Mary gave you in your lifetime, I beseech you to protect me all through life, so that I may never separate myself from my God by losing His grace. My dear St Joseph pray to Jesus for me. Certainly He can never refuse you anything, as He obeyed all your orders while on earth. and then do with me what he pleases. And by that assistance which Jesus and Mary gave you at death, I beg of you to protect me in a special way at the hour of my death, so that dying, assisted by you, in the company of Jesus and Mary, I may go to thank you in paradise, and in your company praise my God for all eternity. Amen. made before the Blessed Sacrament. for all who seek him? in the tabernacle – waiting. and to seek his help. allows us to taste and enjoy! of the Lord in the Eucharist? and desire nothing but you. with distractions and dryness in prayer. of these we must not make much account. Do not on this account leave off prayer. our meditation would be of great profit. any sensible desire of loving God. without any way of escape. My God, I desire to love you. PRAYER of one in deep affliction. though I feel you far away. lest from you I stray. 2. To make acts of love toward Jesus Christ. to the will of Jesus Christ. 5. To communicate often and many times in the day to make spiritual communions. 8. To desire Paradise and Death in order to be able to love Jesus Christ perfectly and for all eternity. 10. To accept contradictions for the love of Jesus Christ. and not to refuse Him anything that is agreeable to Him. that does not belong to Jesus Christ. that she may obtain for us the love of Jesus Christ. 18. To seek to please Jesus Christ in all of your actions. 20. To be always determined to die rather than commit a willful venial sin. 30. To drive away melancholy. 31. Often to recommend yourself to those persons who love Jesus Christ. 38. Neither to say nor to do anything that might vex him. And if you have been wanting in charity, to ask his pardon and to speak kindly to him. 40. To offer to Jesus Christ all the contempts and persecution that you meet with. 41. To look upon Superiors as the representatives of Jesus Christ. and not to seek your own satisfaction in anything. 43. To like the lowest employments. 49. To be silent when you are disquieted. Mary is our Mother — not by the flesh, but by love. That is, she is our Mother by love alone. So someone observes that she glories in being the mother of love. She is all love for us, her adopted children. The first reason for Mary’s great love for human beings is that she loves God so much. She loved him more in the first moment of her existence than all the saints and angels every loved him or will love him. Just as there is not one among all the blessed who loves God as Mary does, so there is no one, after God, who loves us as much as this most loving Mother does. Furthermore, if we heaped together all the love that mothers have for their children, all the love of husbands and wives, all the love of all the angels and saints for their clients, it could never equal Mary’s love for even a single soul. Mary, to obtain the life of grace for us … offered her beloved Jesus to an ignominious death, and watched him die before her eyes in cruel and unexampled torments. It is written of the Eternal Father, that God so loved the world as to give his only-begotten Son (Jn 3:16), so also we can say of Mary, that she so loved the world as to give her only-begotten Son. Yet Thou breathest flames to me. How shall I Thy beauty bear? Lest my heart with love should break. I must press those lips to mine. Mother's love will take no nay." Many a loving kiss impressed. Fixed a look of heavenly grace. How they pierce the Mother's heart! Through her gentle bosom dart. Mary's love, and still be cold? Where, my soul, thy sense, thy reason? When will these delays be o'er? Are but smoke: resist no more! Captive to those double charms. If, alas, O heavenly beauty! For no other bliss I pine. Love alone is full delight. St Alphonsus' Morning Meditation for Christmas Day. Let every soul, then, enter the Cave of Bethlehem. Behold and see that tender infant, who is weeping as he lies in the manger on that miserable straw. to love God who is infinite love, and who came down from heaven, and made himself a little child, and became poor, to make you understand the love he bears for you. 'Ah beautiful Infant! Tell me whose child art Thou?" He replies; "My Mother is this pure and lovely Virgin who is standing by me." "And who is Thy Father?" "My Father," he says, "is God." "How is this? Thou art the Son of God, and art so poor, and why? Who will acknowledge Thee in such a condition? Who will respect Thee?" "Ah," replies Jesus, "holy faith will make know who I am, and will make Me loved by those whose souls I come to redeem and to inflame in my love." Come, then, O all ye devout souls. Jesus invites you to come and kiss his feet this night. you must also bring your gifts. What will you bring him? The most acceptable present you can bring him is that of a contrite and loving heart. To love God, we must first desire to love him. If we do not want something, we will, certainly go to little trouble to obtain it! So it is with the love of God. will soon fall totally away from God. On the other hand whoever aspires after holiness, and makes daily efforts to advance, will, little by little, attain it. God leaves no deisre without its reward. But let us not trust to our own efforts to advance in holiness, but hope for all from and through God. He will give us strength which, of course, we do not possess. I can do all things in him who strengthen me. Many desire holiness but never take the means to gain it! but such desires are mere fancies. The devil has no dread of irresolute souls. Let us then fix our minds in the ways of God. Let us resolve to meditate each day on the passion of our Lord Jesus Christ. Let us resign ourselves in peace to God's plan for us. Let us endeavour, in the time remaining to us, to give all to God. may God help us to give ourselves to him. Jesus, my saviour, help me. and to leave all to please you. who have loved me so much. to belong wholly to God.